This entry was posted on February 28, 2017 by Jessica Anderson. 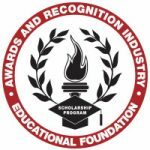 Congrats to one of Trophies2Go's kiddos, Joseph Hanson, for winning one of the three 2016 Presidential Scholarships from the Awards and Recognition Industry Educational Foundation (ARIEF). Joe, our Production Manager Tom Hanson's son, was awarded the 'Awards Associates Scholarship' at our trade show in Las Vegas earlier this month. 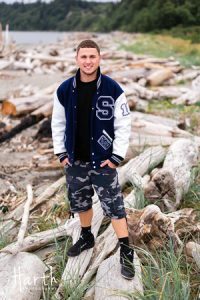 One of Joe's teachers at Silver City High describes him as an outstanding person, student, and athlete; active in school, extracurricular activities and his community. With a 3.6+ GPA, he is a member of the National Honor Society, was Kiwanis Student of the Month, and received the "ScholarBaller" Award for being a student athlete with a 3.5 or higher GPA. He is varsity football team captain, leading his team to 3 consecutive playoff state championship appearances and participates on the track team in the off season. He has a positive attitude and is responsible and caring. He is well deserving of recognition! Other Trophies2Go scholarship recipients include Chelsea Peart, Zach Hall, and Ryan Peart. Thank you to the Awards and Personalization Association and in particular the ARIEF scholarship committee for their generous support of Trophies2Go students and students across the country. We appreciate the giving nature of our industry, it's the best! And Congrats again to Joe!